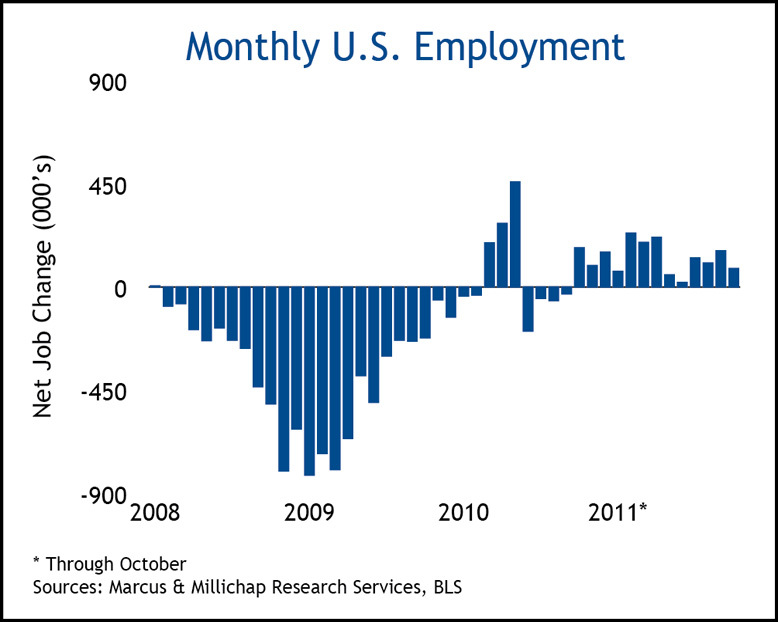 The pace of hiring in October remains consistent with the moderate GDP performance and reflects the protracted US economic recovery. Similar to prior months, private-sector firms added jobs in professional and business services, leisure and hospitality, and healthcare. The headline unemployment rate edged down, but has made little progress recently, fluctuating within a narrow band since earlier this year. The average workweek has held constant, reflecting no acceleration in the number of hours worked over the past 12 months. Consequently, this slack in the labor markets creates little upward pressure on hourly earnings, which currently trails the pace of consumer price inflation and suggests less real take home pay and weaker discretionary spending. Employment grew by a net 80,000 jobs in October, continuing the pattern of private-sector gains blunting losses incurred by government restructuring. The private-sector added totaled 104,000 jobs last month compared with the loss of 24,000 jobs by state and local governments. Job gains in trade, transportation and utilities totaled 35,000 – largely powered by nearly 18,000 retail positions – outpacing growth in professional and business services. Education and Health Services recorded 28,000 new jobs, exhibiting positive momentum across all subsectors. Leisure and Hospitality expanded payrolls as well, with the gains highly skewed toward the food services sub-category, which captured 80 percent of job gains. In addition, significant upward revisions to employment data for August and September netted a total of 102,000 additional workers added to payrolls. In perspective, monthly payroll trends may appear fairly mundane, but measured on an annualized basis; total employment expanded by 1.5 million jobs as of October and represents an average of 125,000 new jobs created per month. Jobs created in the private sector total 1.8 million compared with the public sector, which shed 323,000 positions in the same period. The 9.0 percent unemployment rate has maintained a range of 20 basis points since the spring, but improved by 70 basis points over one year ago. Similarly, the unemployment rate for teenagers and 20-24 year olds, while still high, reflect an annualized decline of 300 and 150 basis points, respectively. The number of long-term unemployed, which has not improved in the past 12 months, and the high rate of underemployment, which stands at 16.2 percent, an 80 basis point improvement over the year, appear to be bigger concerns. A durable recovery in the retail sector relies not only on sustainable sales, but also strong wage growth – a more problematic issue given higher consumer inflation rates and weaker earnings. Wage growth should significantly improve in response to hiring momentum in the next six months. Positive economic trends will support retail demand through increased consumer spending, pulling down vacancy 20 basis points in the fourth quarter to 9.7 percent and 50 basis points next year. Strong job gains in the younger age cohorts – those with the highest propensity to rent – will unlock an increasing number of new household formations. Apartments will outperform the for-sale market in the foreseeable future as households remain mobile to remain eligible for more employment options or relocation mandates. The national apartment vacancy rate will retreat to 5.4 percent at the end of 2011, an annual improvement of 120 basis points. This entry was written by marcusmillichap, posted on November 5, 2011 at 1:14 am, filed under Uncategorized. Bookmark the permalink. Follow any comments here with the RSS feed for this post. Post a comment or leave a trackback: Trackback URL.